If it hadn’t been for DailyKos front-pager Greg Dworkin’s link the other day, I would never have known about a statement in that diary. As a rule I don’t have time to read the APR when it’s fresh and hot; on this particular morning, however, Younger Son was late bringing the baby to my house, so I had time to look around the site and read whatever caught my fancy. Meanwhile, it is difficult for him [Bernie Sanders] to make inroads among women who are understandably excited about finally getting a woman president. 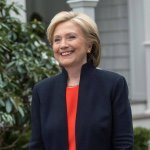 As much as I like Bernie Sanders—in fact an online test showed me that I agree with his policy positions 94 percent of the time—I plan to vote for Secretary Clinton in the primary (if we can call George W. Bush by his previous title of “President,” I can certainly call her “Secretary Clinton”) . If you’ll bear with me for a few minutes I’ll tell you why.